We have had a bit of family illness to contend with recently and my son has dealt with it like a super hero. I promised him that I would take him to LEGO Land Windsor and that we would stay in the resort hotel. To be perfectly honest staying in the resort hotel is incredibly expensive, for the same amount you could probably stay in a cheaper hotel for three days. We had an early start on the morning of our expedition and many different trains to catch but we managed to get to LEGO Land in one piece. The outside of the hotel did have a wow factor and was so child orientated that nobody needed to nag their children to stand still and wait while you checked in. 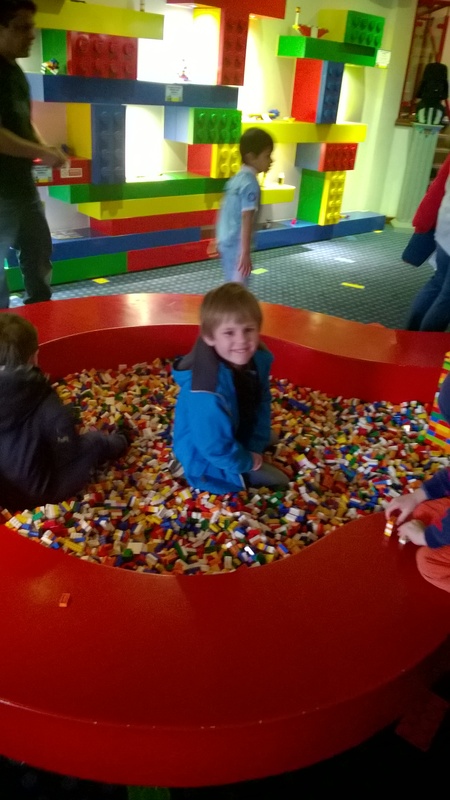 The greatest attraction in the reception area was a large sand pit full of LEGO, tearing Alistair away from that proved to be quite difficult and we hadn’t even entered the park. We couldn’t go to our room until three o’clock so we spent the next three hours exploring the park. It was a bit disorientating entering the park from the hotel because you are essentially entering it from the back into the quiet part. We wandered towards the Viking area and went on the spinning log ride. Most of our time was spent wandering around and squirting water on the people doing the wet rides. We had some doughnuts and a drink then went to the shop to buy a big LEGO cube storage box. We were both a bit tired and relieved to get back to the hotel so that we could enter our room. The floor our room was on was fantastic and kitted out like an Indiana Jones set. 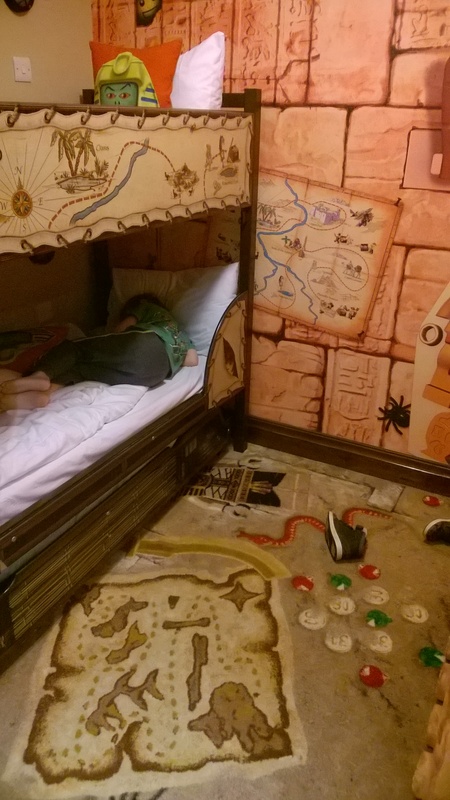 Our room definitely had the wow factor and the children’s bedroom bit was everything a little adventurer could hope for. The carpet had pictures of scorpions, spiders and bugs on it and the walls were decorated with Egyptian hieroglyphs and Lego sculptures. The adult side of the room was near the window and looked like a luxury hotel room with a really comfortable double bed. There were two televisions so the children can watch Lego TV and the adults can watch Midsummer Murders. On the side was a set of clues instructing the child to count four objects so that the answers could form the combination of a safe. We were hopeless at counting and eventually managed to unlock the safe to reveal a Lego car. We spent an hour resting and snacking on our packed lunch before getting ready to go into the hotel splash pool. It was great splashing about and extremely hot. 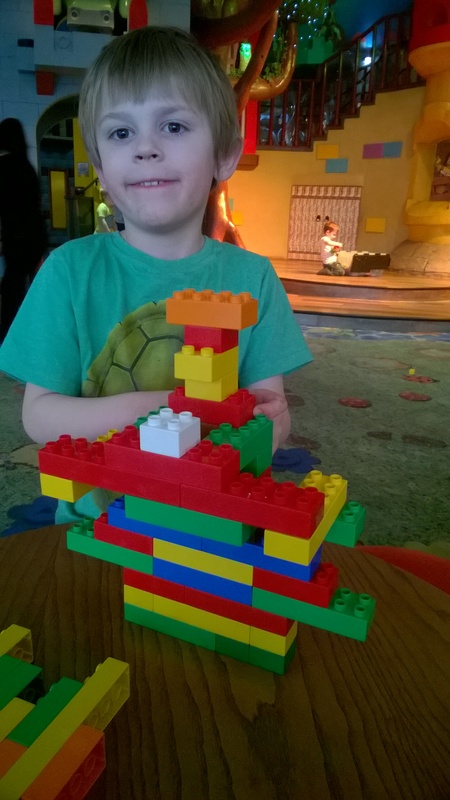 We went to the restaurant for dinner and entertainment – the entertainers did a sterling job of playing Simon Says and setting Duplo building competitions. Finally it was bed time and I was so stiff I could hardly walk. Alistair fell fast asleep without a fuss and I wasn’t long after him. We slept soundly until seven o’clock in time for a 7.30 breakfast. The breakfast selection was fantastic and you could eat as much as you wanted to. We didn’t have a cooked breakfast and Alistair could only manage a small bowl of cereal because he was so excited. We stayed in the lounge for a short while until we went upstairs to pack and check out of the hotel. After handing my rucksack in to be looked after we spent the next three hours enjoying the park. 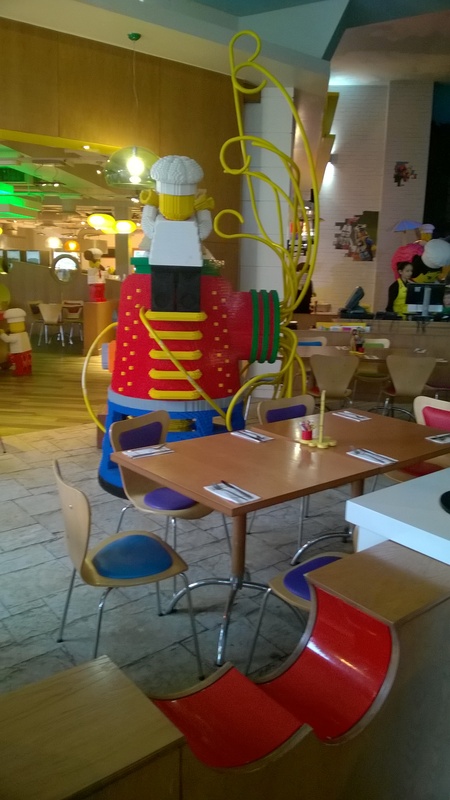 Lego Land has been designed to accommodate children of all ages and abilities and the staff are really good with children. 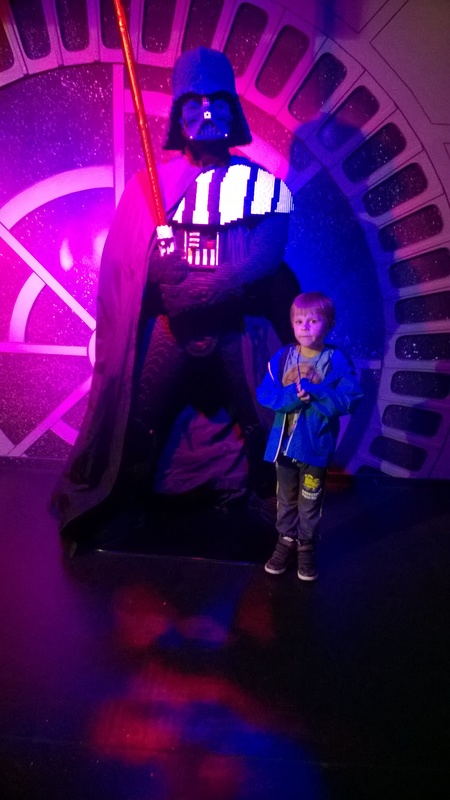 Before 12.30 a Lego driving licence was acquired, we saw sharks, we went on a train, we saw the Star Wars exhibition and models of all of the major cities in the world. We also had a play in one of the playgrounds which like the rest of the park had an inclusive playground design allowing all children to have the best time ever. We spent the last half hour in the reception area playing with Lego and spending money in the shop until the Taxi arrived at one o’clock. 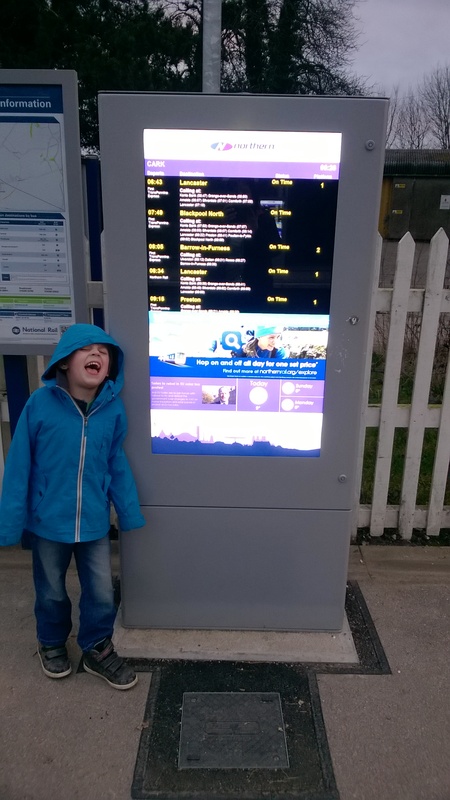 We were taken straight to Slough Station and had a tiring but good journey home. It wasn’t until I looked in the mirror did I realise that I looked a complete mess. My eyes were swollen and starting to go black the next day to the shock of my friends who said that I looked as if I had been mugged. Anyway my son said that his holiday had been, ‘better than awesome’, which was all I wanted to hear. Author Gill Jepson telling her stories about Furness Abbey in the abbey. When looking at different cultures it is extremely interesting to notice the different ways in which we approach religion, morality, social structure, appearance and of course food. Fundamentally the needs of human beings are exactly the same but how they are provided is determined by those who rule our societies. Different belief systems tend to be the greatest determiner of how a country is run. One element of every culture, that is almost identical, is the act of storytelling. Traditionally storytelling was used as a way for elders in a society to teach younger generations about the strife of life and the values of their community. Stories were passed down each generation like heirlooms changing and growing in each telling. Cavemen in France told stories about hunting and battles against enemies by drawing on cave walls. As communication got better and people could share ideas through a common language stories became the main entertainment in any society. Before electricity and the microchip revolutionised the world candle light or the flame from a camp fire was the only source of light groups of people had to gather round. The most striking image that comes to mind is that of the Native American Pow Wow. Tribes would sing songs and tell stories about the world around them to the flicker of warm protect flames. Without the use of technology and special effects it was up to the storyteller to keep their audience engaged. As society has become more sophisticated, storytelling is presented in the form of; films, plays, computer games, songs and television programmes. I haven’t included books because I am concentrating on the performance side of storytelling. It doesn’t really matter how good special effects are, if the story is weak then the film will flop. Stories have maintained their durability due to people retelling them over and over again. Being able to communicate and anticipate are two very important skills in life. Without these skills our lives would exist very much in the present and we would be very vulnerable to the trouble and strife of life. Retelling stories helps children to structure sentences while they are speaking and get their message across. Being able to think ahead and consider the implications of any decisions you may make is an extremely valuable skill to learn. Just being able to sequence a story will help you deal with maths problems. Eventually people started to write down stories so that they would not be lost by the passage of time. At first reading and writing was a pleasure that only religious figures and insanely rich people could enjoy. The introduction of the printing press in the 15th century eventually led to more people having access to books and eventually the existence of schools. Reading is generally a private activity where one person can immerse themselves into a fantasy world from the safety of their arm chair, while storytelling is very public and involves lots of people. Schools are very keen to reignite the concept of storytelling because of the many factors I have mentioned above. As well as storytelling areas in the classroom schools have installed storytelling chairs in the playground. Sometimes the storytelling chair is surrounded by little seats or benches so that everyone can gather around and enjoy stories being told like our ancestors told them. Storytelling is always going to be with us and the history of storytelling is one huge story in itself. The Spring term is the shortest one in the year but probably the most intense. Teachers of year two and six will be psyching themselves up for the SATs that can now determine whether a school is good or not. My son has finally reached the age where testing will play a major part of his school life and he will be expected to perform to his best abilities to prove that he has been taught correctly. He will participate in writing, reading and maths tests and will face an onslaught of practice tests until he has to do the real ones. I am all for assessment and how it informs planning for his further learning but I hate the way that it is also a test for the teachers. There are many things that teachers do that are not accounted for in the test so their true worth is not represented in the results. The tests don’t take into account the non academic strengths a child may have and we get so tunnel visioned about what children can do in the test that all of the other important life skills are forgotten. GCSEs and A levels are understandably stressful because they are transitional and the better you do the greater your career choices but with SATs there are no obvious benefits for the child. Motivating a child to do a test that has no reward seems to be cruel and unnecessary and the pressure is too great at such a young age. I really don’t like the concept of a child perceiving themselves as a success or a failure at such a young age. My son is looking forward to going back to school to see his friends and play on the playground equipment in the play area next to the school. He loves learning and finds learning opportunities everywhere left to his own devices he has learnt how to follow instructions to build Lego sets, figured out how to build a computer game, how to look after a puppy, that adults are only human and that he loves performing. He sets himself challenges and gets so excited when he achieves them, his first words were, ‘I did it’. I don’t want vigorous testing to destroy that thirst for knowledge and a curiosity to learn. I feel nervous about the tests in the same way I did when I let him have the MMR vaccine. Why Do Children Love Getting Into A Spin? Toddlers do it, puppies do it and crazy adults playing drinking games do it – we all love spinning around in circles until we get dizzy. My son used to purposely run round in circles saying he was trying to make himself dizzy before collapsing onto the sofa. Another favourite activity is spinning on an office chair and we have all had great fun making playground roundabouts go faster and faster. Why do we like spinning? Being the peculiar creatures we are – we just like the giddy feeling spinning causes. As well as causing the state of the brain to temporarily change, spinning stimulates part of the brain that trains the body how to balance – this is called vestibular stimulation. The same part of the brain is trained through swinging, hanging upside down and rocking. Roll down banking – choose one that is not too steep without too many obstacles in the way. Go on a playground roundabout – they are really safe now and some even have space for wheelchairs. Go on a fairground ride like the carousel or the waltzers if you are extra daring. Spin around when you are dancing, spread your arms out for more balance. Go Zorbing – this is a spinning activity for grown ups but try it if you dare. And for those of you who are curious about what the drinking game is (and what your teenage sons maybe up to) here is a video clip of what I am talking about. We are getting to the time of year where Christmas is upon us and we can no longer pretend that it isn’t happening. Children have been cast in their Christmas plays – mine son is Steve the Donkey this year. Parents are still panicking about Christmas parents for their children. Some people have got it all wrapped up, Christmas cakes baked and Christmas cards sent. Everybody is rushing around getting ready for the main event and preparing for the Big Man himself. I am not organised, apart from having bought my son’s main present and thought about decorating the house, I am completely unprepared. I have had the bright idea of making decorations and buying lots of chocolate so that we can all get into the spirit of things. My son seems to think it unnecessary to write a letter to Santa because if he has the power to tell if you are naughty or nice – he can hear your present requests. Any way here are a few phone apps and websites that will make Christmas fun for your children and help you to get them to bed on Christmas Eve. 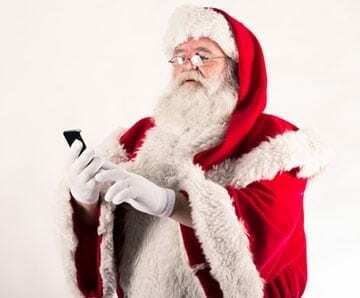 If you want to prove that Santa exists to sceptical children then this may be the app for you. Basically you project an image of Santa on a picture of your room so that it looks as if he has really visited. I am not sure exactly how it works but just follow the link and try it for yourself. This is one site I visit every year with my son, he takes Santa’s opinion about him very seriously. This site is so cool because it gives you the opportunity to add pictures to a video of Santa and recommend if your child should go on the naughty or nice list. We watch the video just before bedtime between looking at NORAD and the Christmas carols. This is another evidence based app which allows you to superimpose elves and Santa on an image of a room in your house. I haven’t tried it yet so I am not sure if it looks as this video when you do it yourself but it is worth a try. I think this is rather exciting simply because spotting any animal is fantastic – especially Santa’s reindeer. Something tells me that as Christmas Eve approaches the images will get an awful lot busier and we will possibly get a glimpse of the man himself. This is a great way to hurry up Christmas Eve bedtime because you can look at how close Santa is to your town. NORAD stands for North American Aerospace Defend Command. Normally NORAD checks our skies to make sure that no unwanted visitors cause us any bother. Fans of Stargate will recognise the Cheyenne Mountain Complex, which is a real department. Anyway from December 1st NORAD activate their Santa search website and track Santa’s journey around the world. I love it when big serious organisations show that they are young at heart. However you make the magic of Christmas happen remember to let the child in you come out and have a fantastic time. We are going for cheap cheerful and tacky this year and going to have a childish time. 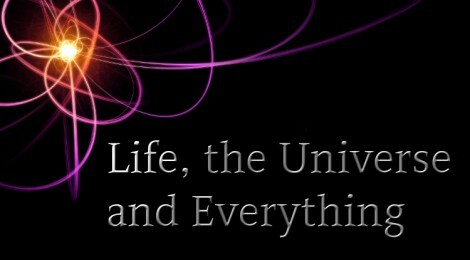 Do Children Know More About Life The Universe And Everything Than Adults do? I have most of my deep and meaningful conversations with my son in the confides of our yellow car. The rest of the time our conversations are pretty mundane and ordinary. On the way to my parent’s house Alistair explained to me that when people died their soul went into new babies and everyone goes to Heaven even if they were naughty. When asked about how this sharing of souls is affected by a population increase he responded by saying that new souls were made. This was an explanation as to why some people seemed to understand life quicker than others – their soul was older and more experienced. My son does go to a church school so some of his theories may have evolved during shared worship. However when I have taught in non denominational schools, children still have a fascination about the creation of the earth. According to Alistair without a doubt God or some other godly entity exists who created everything – this of course leaves one question remaining – Who made God and who made the person who made God and so on … ? Maybe this interstellar insight is the reason why elderly people flock around newborn babies as if they are the Ark of the Covenant. They all want a little piece of Heaven – of course by the time your baby is a screaming toddler who will not get up off the floor they scuttle past with stealth. For children a belief in an omniscient one is simple, while being an adult your thoughts are tainted by everything negative related to religion. At the moment religion seems to be causing more problems than it is solving because people are doing awful things in the name of their god. If the Almighty is displeased why can’t he/she/it be left to vent his/her/their own wrath on the world. The Christian Church is heading towards its most famous celebration in the whole of its calender – we do have to remember that many toddlers were sacrificed to enable one child to have safe passage. Poets like Wordsworth and Coleridge tended to acknowledge that the countryside and all of its wonder were proof enough of a higher entity. I read an article called, ‘How Sand And Water Play Can Unlock The Secrets Of The Universe‘, and in it is says that the Universe means everything around us and that we are all made of stardust. It demonstrates the simple fact that children who are very young believe in a god in the way they did before science, writing and religious leaders tweaked the word of god to suit their own purposes. Maybe we will all find god in the sandpit or water fountain or at least appreciate the wonders of our universe – however it was created.